Cocopah Councilwoman Rosa J. 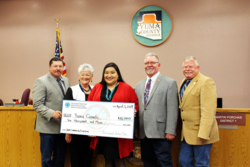 Long presented the Yuma County Board of Supervisors with a $10,000 donation to support the Yuma Community Food Bank. Each year Native American casinos donate a percentage of their profits to local governments in support of community programs. 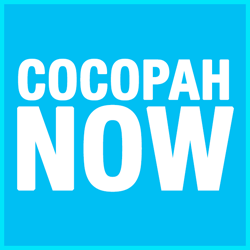 Cocopah Vice Chairman J. Deal Begay, Jr. (right) and Councilwoman Rosa J. 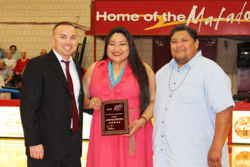 Long (center) accept a recognition plaque from Arizona Western College Sports Information Director Tim Slack. Cocopah Vice-Chairman J. 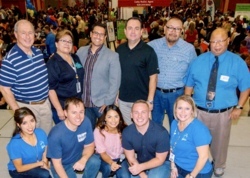 Deal Begay, Jr. (fourth from the right) and Cocopah Councilwoman Rosa J. Long (fourth from the left) present the annual profit share check to Somerton city council. Will Bert Ortega Sr. was honored by Kofa High School for his role in winning the state football championship in the early 1960s. 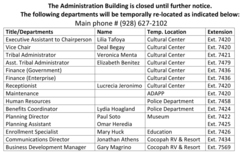 These departments have been relocated and can be reached by phone. We apologize for any inconvenience this may cause. Cocopah Vice Chairman J. 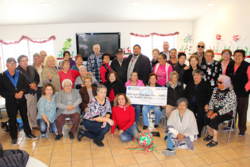 Deal Begay, Jr. presents a $1,000 check to patrons and staff at the Desert Valley Senior Center in Somerton, Ariz.
Each year, the Cocopah Tribal Council makes a donation in support of the center's Christmas gathering. 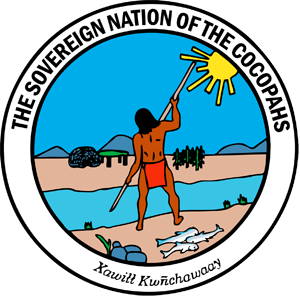 The 22nd Annual Cocopah Cultural Celebration will be held from 10 am to 4 pm on Saturday, Oct. 20 at the West Cocopah Reservation. 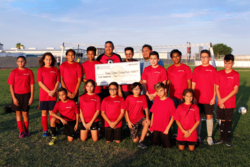 The Cocopah Indian Tribe donated $500 to support the Yuma Titan Futbol Club. 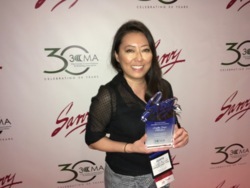 The City-County Communications & Marketing Association presented the Cocopah Indian Tribe with a Savvy Award for the Best Graphic Design Publication. The Cocopah Indian Tribe supports the 2018 Back To School Rodeo.